The African Queen 2006 Diary Page. See what we get up to this year. January 2006. Another quite start to the year, only 2 trips, both out to the inshore wrecks. Managed a few reasonable Pollack but nothing of any real note. The Codling are conspicuous by their absence again, even fewer than we had last year. Still finding the odd Mackerel!, in January! its getting to be a funny old world. February. Had 4 trips booked this Month so far, and have cancelled them all through bad weather. Today Saturday 25th. It is Easterly force 6-7 gusting Gale 8. The crew we should have fished with today are making the most of it propping up the bar in the Yacht Club. March. Lost the last 4 trips to bad weather again, I hope we are not going to have the same weather as we had this time last year, we lost all the early Spring Plaice fishing to high winds. We'll just have to wait and see. March 25th. We should have been out again today but are sat in harbour with force 6-8 SW gales, at least the winds have shifted from the East. So, nothing to report again. I was talking to a local crabber yesterday and he told me he had got out to his pots twice in February and only once so far in March! If them guys don't go, you know its rough. April 8th. 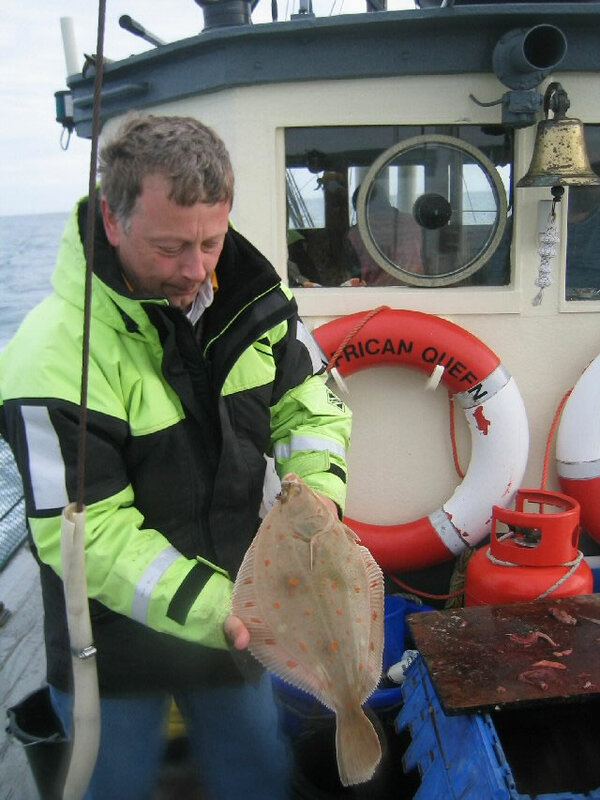 One of our regular crews arrived to fish with us all week, a decent weekends forecast at last, out to the Skerries with some nice bait and into our first drift of the season, 5 minutes in and bang, the first plaice is flapping in the net. Working down and across the banks we fished for the rest of the day, result just the 1 Plaice, 1 Doggie, and a dozen Launce to feathers. Sunday, we anchored a wreck and caught a bin full of Pout and a few Doggies. Usually at this time of year we are well into the Plaice and don't have to look for anything else, at the moment the banks seem almost devoid of life. The water is still very cold with a temperature of only 8.5 degrees c, normal temp for this time of year would be nearer 11.c. Lets hope this is the reason why and the fish are only late. Time will tell. A pic of Hanna with a Pout she caught, at least she was happy. 12th April 18 nice Plaice in fairly windy conditions, the fish took some finding and were only feeding for half of the tide, still, not bad with only the 3 fishing. See pic on left. 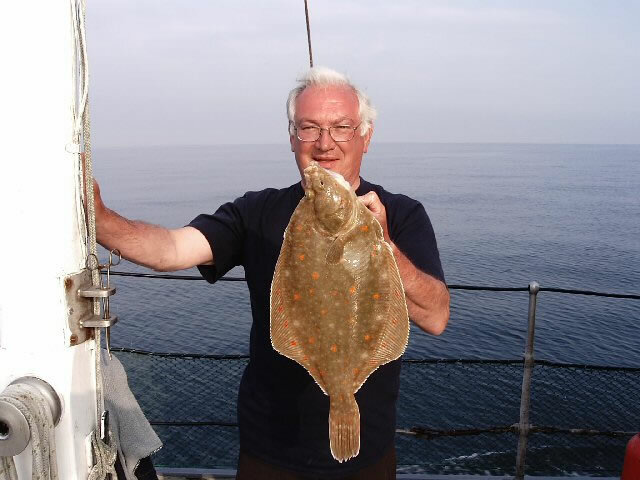 14th April The best days weather so far this year, bright, warm and another 18 Plaice, this time between 6 anglers. It is quite obvious from the individual bags of fish that we see caught, that the best anglers will always catch more fish. 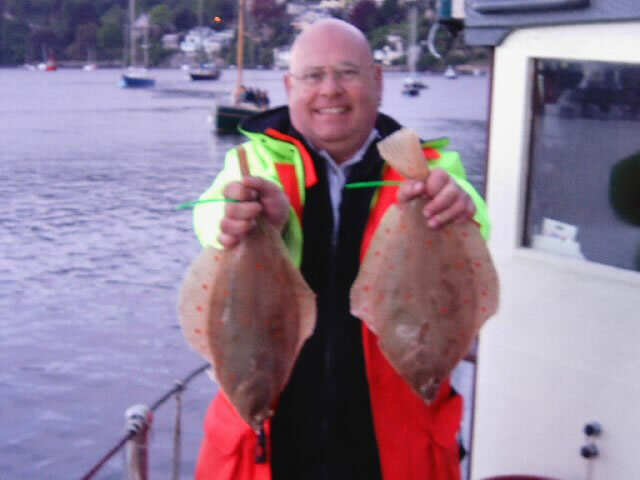 These Plaice, especially on the bigger tides, have to be 'fished for' in a certain way, if you chuck down a bait and drag it along, hoping a Plaice is going to 'hang on' you are going to be very disappointed with the number of fish you land. We are very happy to spend time with you, and instruct you on the finer points of angling if you are not very experienced. 16th April Only a few Plaice, but we were fishing with inexperienced anglers, saw the first of the Mackerel, loads of Herring and other bits and pieces. 22nd. Easterly winds again, very uncomfortable day at sea. Managed 10 Plaice, some Mackerel and a few Doggies. Sunday 23rd. Much kinder conditions, it was almost warm at one stage, lighter winds. 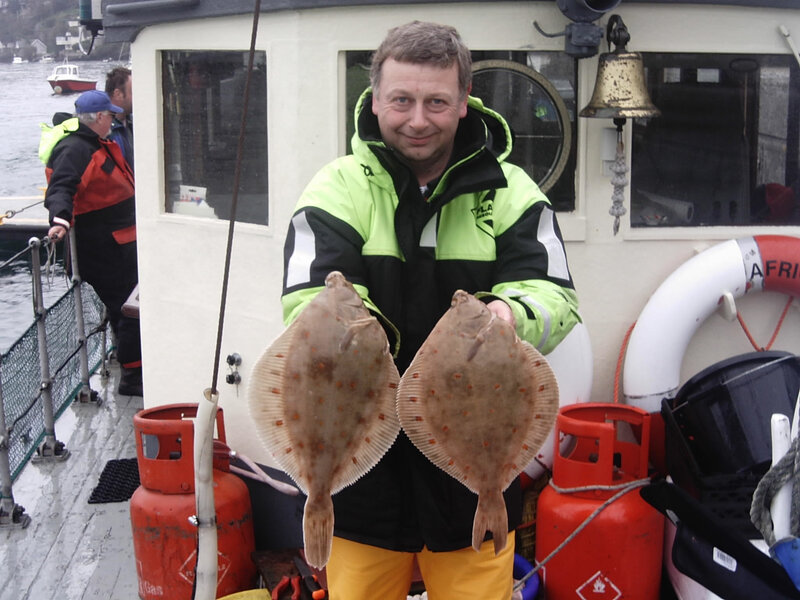 17 Plaice with a few nice ones among them, see the photo of a nice brace for Tony. Wed. 27th. Half day trip with holidaymaker's, 2 lovely Dutch Children, out with their Mum and Dad, plus a few others. Every one caught Plaice, loads of Mackerel for anyone who wanted to catch them and to cap a lovely day, we had constant sunshine and a flat sea. A pleasure to be out, what a shame it wasn't an all day trip. When the fish are biting I just don't want to come in. 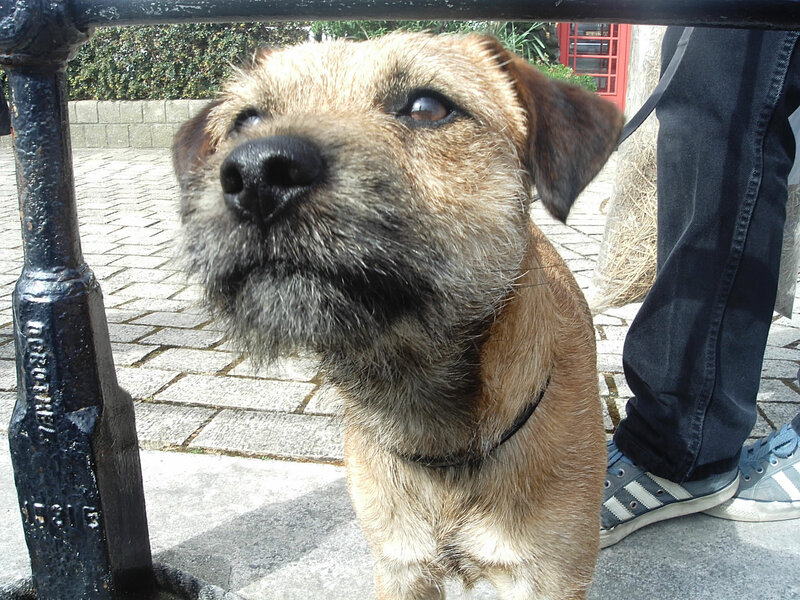 We ended up with 12 Plaice, a box of Mackerel, with a lone Doggie and a Herring. 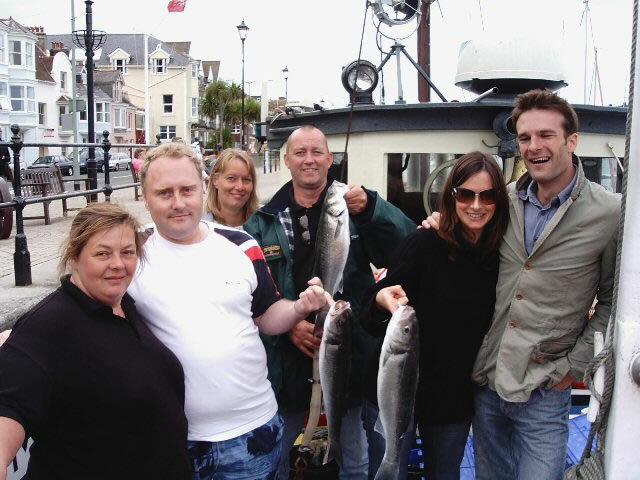 See a pic of Chris and his 2 girls with a nice couple of fish. Sat. 29th. 21 Plaice to 3lb. 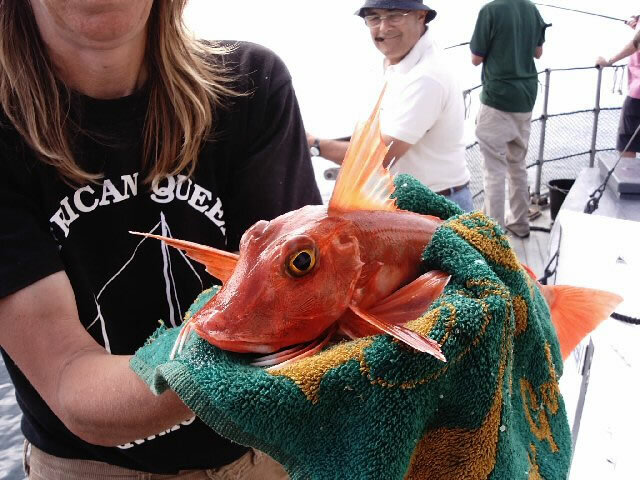 Bags of Mackerel, Herring and a few bits & pieces, including our first Gurnard of the year. Sunday 30th. Dave and Sajeda's Wedding. We were asked to take the Bride and 3 Bridesmaids up the River to Dart Marina for their Wedding Day. Monday May 1st. Went out with some of the wedding guests and caught 17 Plaice, the Mackerel were nowhere to be found today. Friday 5th. Fished with a local group, Plaice were very hard to find, so we opted to fish a local inshore wreck where we took around 30 Pollack to 9lb. Sat 6th. Local group, Plaice were hard to find again but managed 8 and then went out to play around the wrecks where we found some quality Pollack and a few other bits and pieces. 9th. Out with 4 anglers who are regular visitors, up from Plymouth, again the Plaice were hard work but ended up with 10 including a few nice fish. 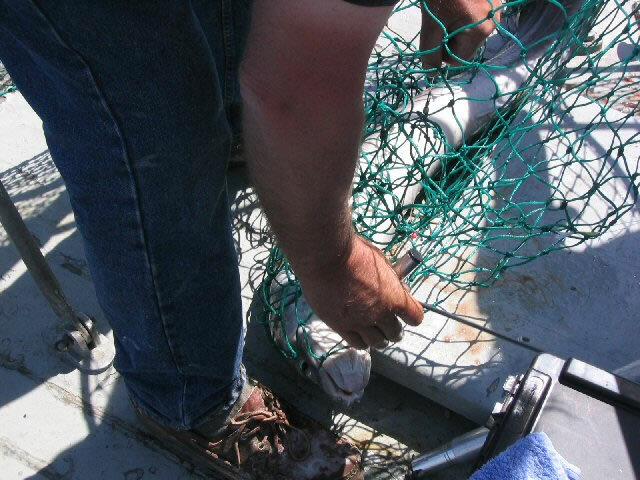 They caught plenty of Mackerel and Launce to keep them busy through the day. Saturday and Sunday 13/14th. Had our regular annual fishing group from Wales to stay for the weekend. It is people like these that give us so much pleasure in our job. A thoroughly decent bunch of blokes who only get together once a year for their trip to Dartmouth. This years trip coincided with the Dartmouth music festival, so their evening drinking was even more pleasurable. 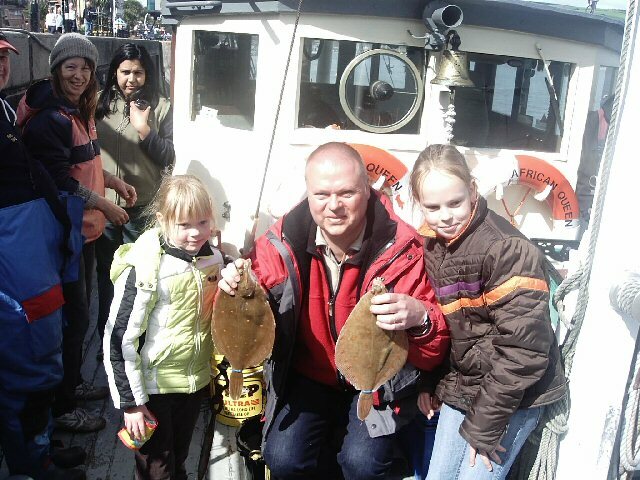 Last trip down they had 76 Plaice over the weekend, shared between the 10 of them. This year they only managed 36, I guess this is a sign of the times. 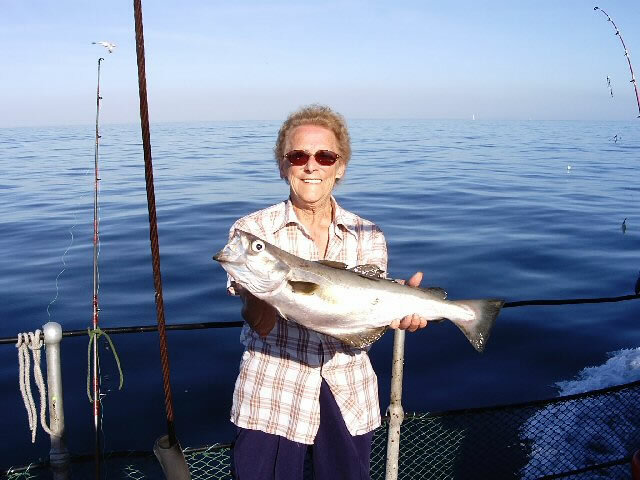 There is less fish to be had year on year, all over the country. 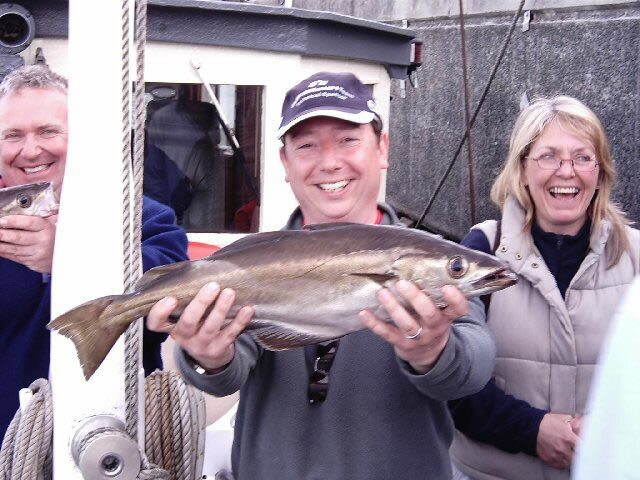 Some of the story's we hear make the mind boggle, a 2 day trip to fish around the Needles during last Winter for Cod resulting with just 2 Pout caught between the 10 anglers. 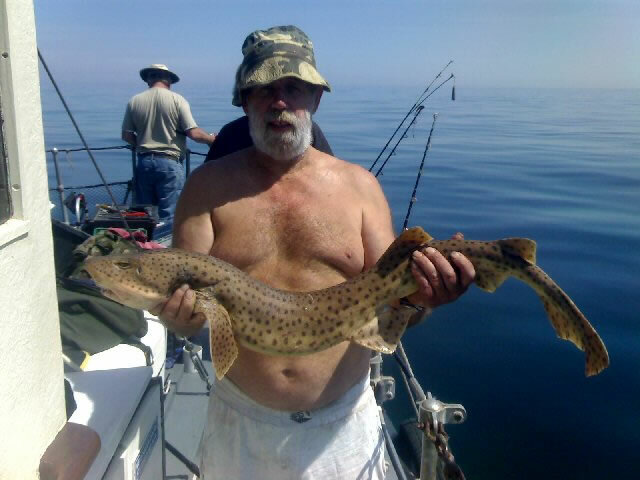 Another group who fish out of Poole normally, told us that the 8 Charter Boat trips they had been out on this Winter, with some of the best South coast Skippers had seen them with only 1 Cod, a nice fish of 18lb. How many more blank trips will they endure before they don't bother going at all anymore ? At least we can normally find something of quality, not all the time, but certainly most of the time we can. 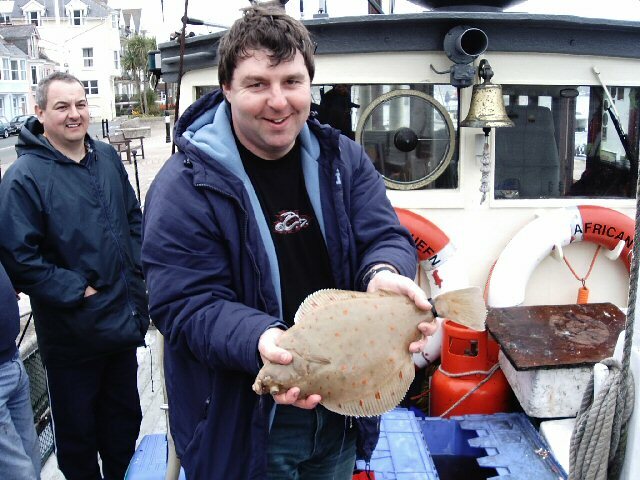 Anyway back to the Lads trip, 36 Plaice only, over the 2 Days, but half a dozen really nice fish up to 3lb. Kelvin had the best brace of the day on the Saturday, with 2 fish over 2 1/2lb. 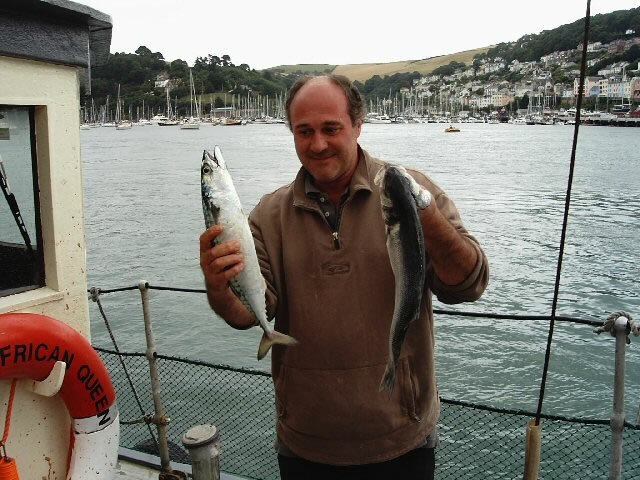 We caught 14 on Saturday and 22 on Sunday, in the last hour of Sunday they bagged up with fresh Mackerel to take home. See photos on the left. 28th.May First trip out for 2 weeks, we have had winds up to force 9, not a very productive day, but we did catch fish. 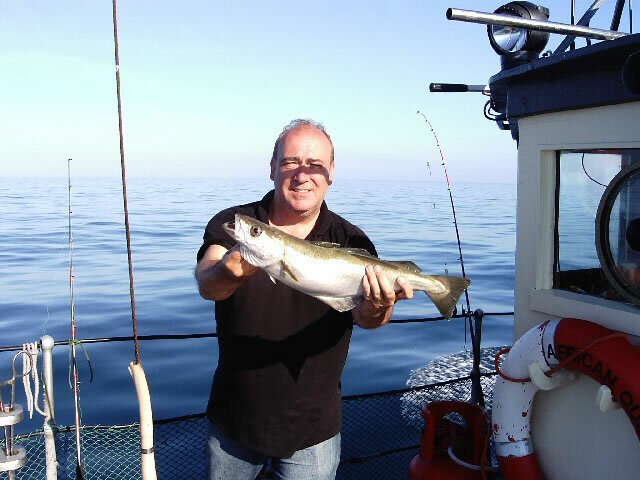 Mackerel, Herring, Pollack, some good Whiting and just 3 Plaice. 29th.May-1st June Half term holidays for the kids. 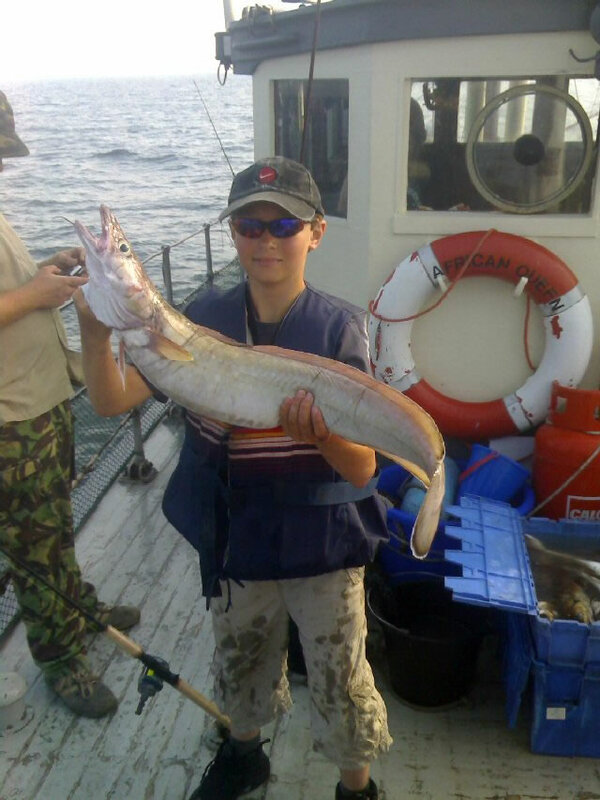 At this time of the year we get into a succession of half day trips with family groups on holiday, its very easy to find them good fishing as the Bay is full of Mackerel and Herring at this time of year. On Wednesday we found a shoal of feeding Bass and ended up with 11 of them. The kids love it because its easy fishing, the parents love it because the kids are happy, and we love it because we can pay a few bills and the pressure is off of us to keep trying to find something of quality for our anglers to catch. A task that just gets harder every year. Sat.3rd. 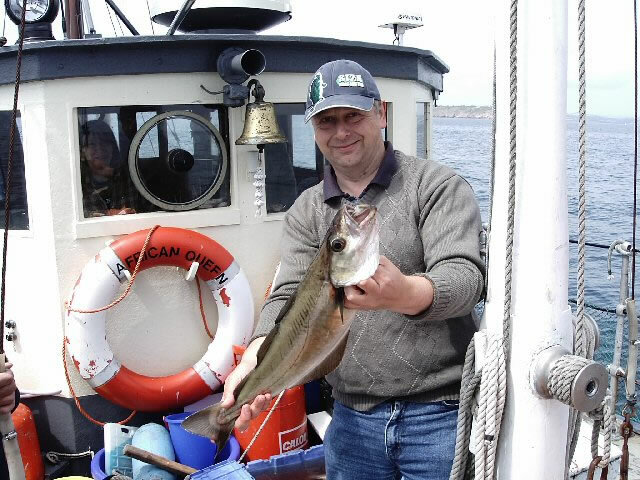 Small tides and the Plaice are not playing ball at the moment, so we anchored a wreck to try for a Conger, result- 7 Conger to 47lb with 5 big Eels lost, and a bonus 16lb Bull Huss. 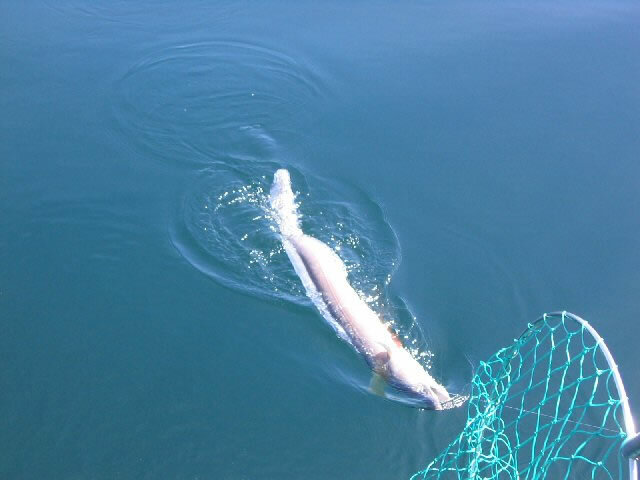 Our anglers returned all their fish, including the Bull Huss. Well done Lads. 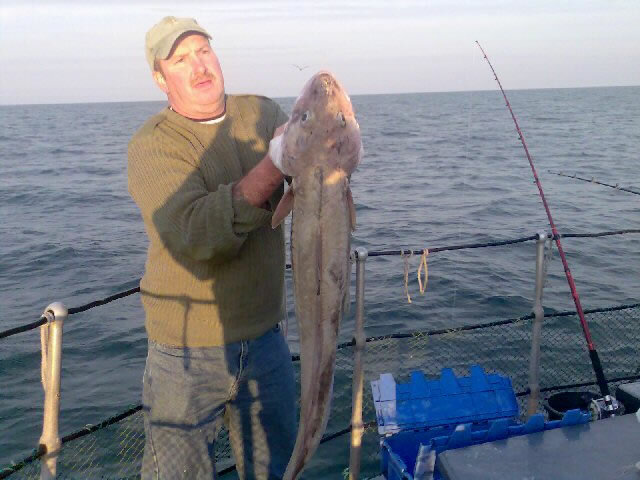 The Bull Huss will be entered for the Shimano catch and release competition they run via the Total Sea Fishing magazine. I hope it wins a prize. Piccys of their day on the left and below. Sun 4th. Mixed day, nothing exceptional, lots of fish with nothing of quality. 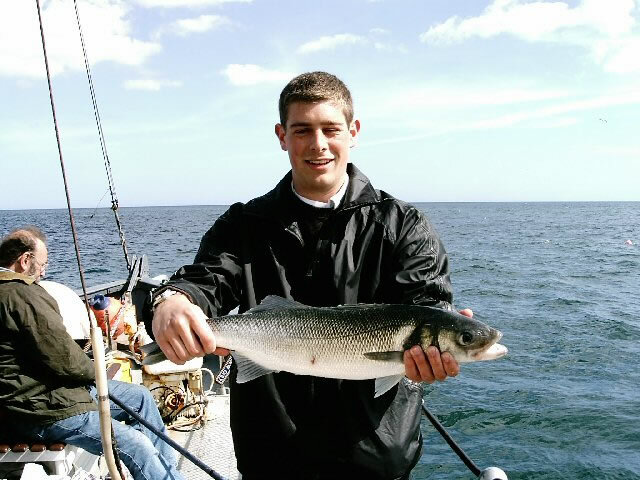 Catch included Plaice, Whiting, Pollack, Mackerel and all the bits we normally pick up fishing the Skerries and the Bay. The week or so up to the 17th. was a lot of half day trips (when we could get out between the winds), with visitors to Dartmouth, inexperienced for the most part but keen and eager. Mackerel, small Bass etc. etc. 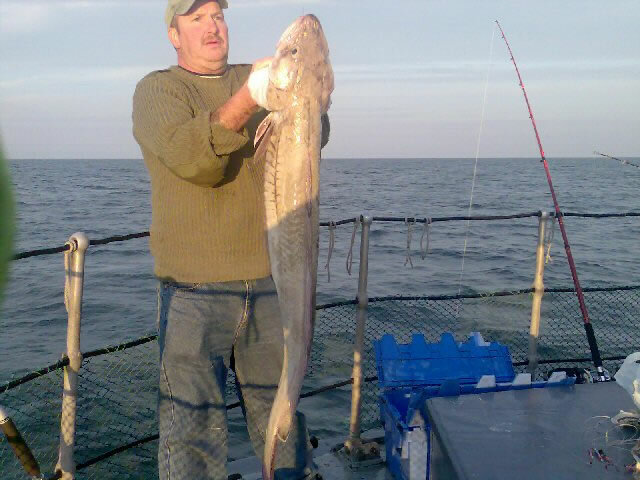 Another Blue Whiting, caught from off a wreck we fish, very rare in these waters and a long way from their normal home. We had one last year that caused a bit of a stir. 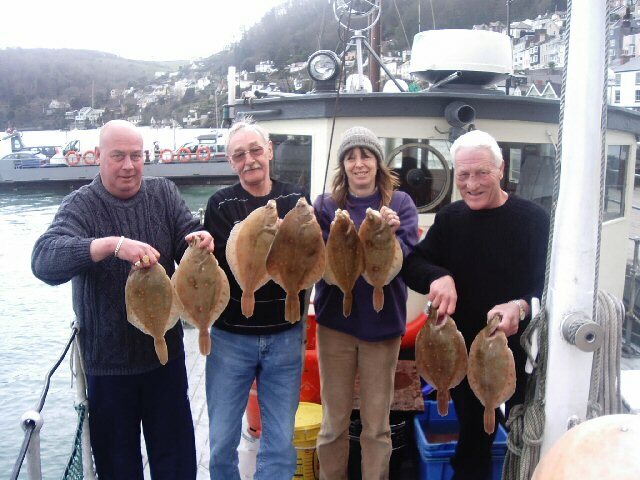 Out on Saturday 17th with one of our regular groups, 9 Plaice to 2 3/4lb slow fishing but some good quality fish. Week to 23rd. Windy again for the most part but managed a couple of trips out. Highlights of the week are a couple of reasonable Pollack, and a nice Bass of 6 1/2lb, which was returned to the water. Well done Daniel, we applaud you! Why kill a lovely fish like that when you can watch it swim away and hopefully keep away from the thousand other hooks and all the nets out there that only want to turn it into money. Worth about £30.00 to a commercial fisherman (and the same to a dishonest 'angler' who thinks its o.k. to take their catch to the back door of the restaurant for cash!) Lets hope it manages to spawn. 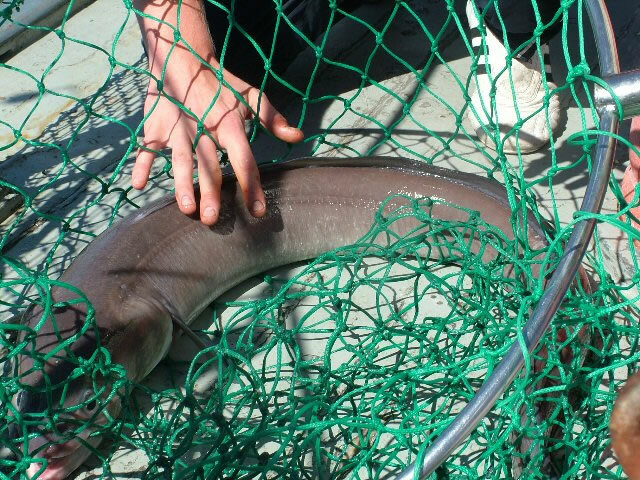 A fish of that size is probably 15-18 years old. See pics. 28th. Half day trip, tried for a Bass but again the Mackerel were everywhere and the bigger ones (2lb plus) would grab anything that was intended for the Bass. 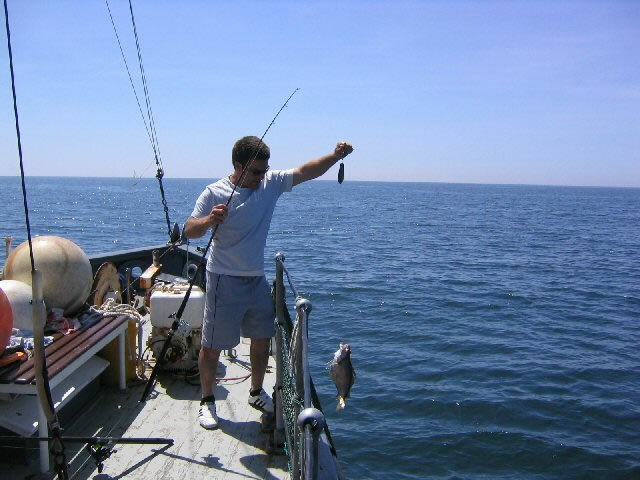 One way to combat this is to use a large live bait that only big fish will tackle, the problem with this method is that if the larger fish are not around you have a very lean time with the bites and the anglers get frustrated. We only took one respectable fish which was a 5 1/2lb Pollack. 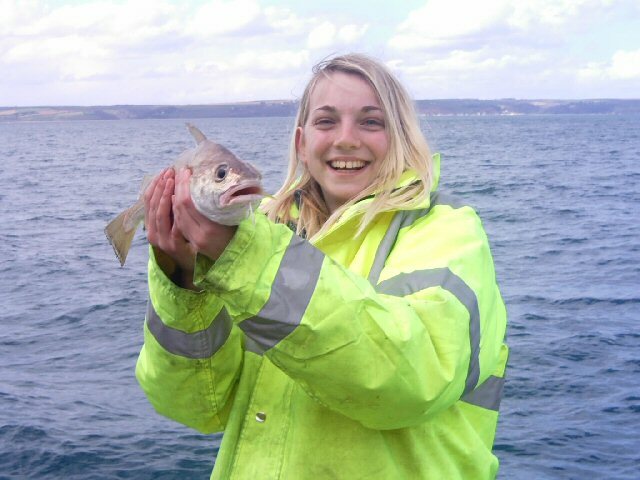 Caught by Cindy on her first fishing trip, well done Cindy, one up for the Girls. 29th. Frustrating days fishing, light winds but with a touch of east again. Always seems to spoil our fishing. Only one highlight, a cracking Plaice just 1oz. short of 4lb. We also had a Flounder on the Banks which is a rarity these days. Lots of bits and bobs again but the Plaice proved hard to come by. We know they are there because the trawlers are getting them, they just don't want to take our hooks at the moment. Sat/Sun 1st.- 2nd July Winds still continuing in the east, but we can still get out. We have been having a go at lots of different things without a lot of success. 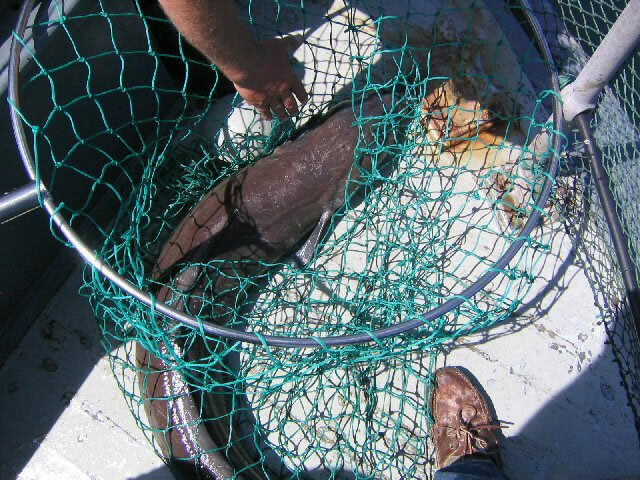 The Bass we are catching are generally undersize, and a lot of the other fish we do manage to catch are proving very hard to tempt, but we are catching fish, and interestingly, when they are gutted, they are all empty, not really eating. This is a consequence as I have said many times, of the east winds. Why, we just don't know. 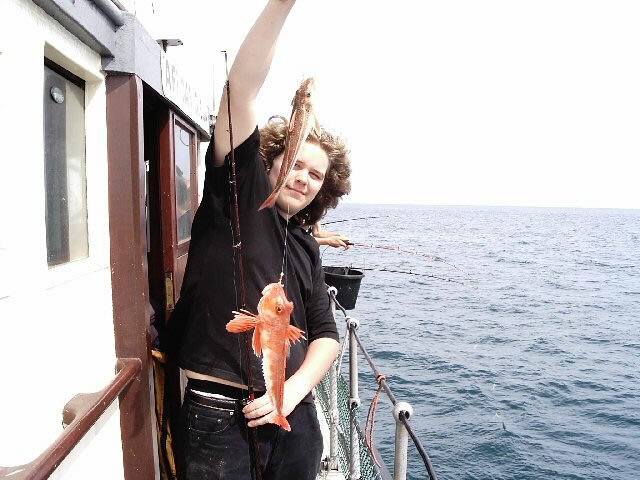 See pic of Christopher with a nice Ling he caught, out with his Dad for a day. 4th. July Corporate day, 7 guys, only 1 who had fished before. It showed, he consistently caught fish right from the off. The others struggled, offering a take-away service to the fish. 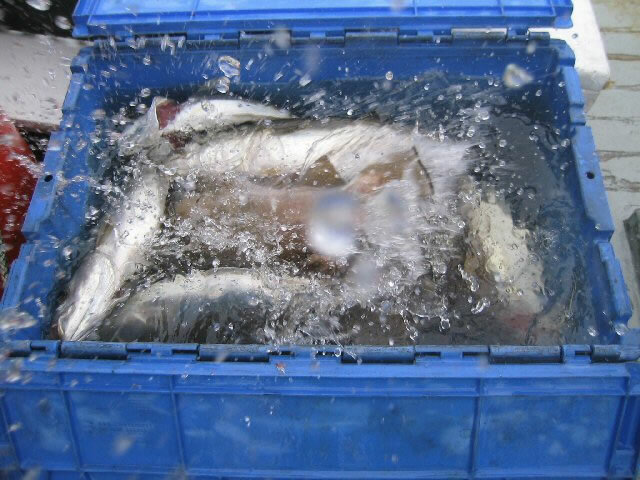 At the end of the day , a lot of fish were taken, with not much of quality save one reasonable Pollack. If they fish again, all the Guys will benefit from this their first experience, which I think from their comments they all enjoyed. 5th-9th. All trips cancelled, East winds finally kicked off and stopped us going to sea. Monday 10th. Tall Ships Race Took a group round to Torbay to see the Big Ships off. A bumpy ride with a big swell remaining from the weekends gales. Calmer in Torbay where we got a good look at some of the Ships at anchor. When the start was due at 3pm just offshore, the visibility was down to a couple of hundred yards, which meant we could not see the Ships going through the start line under full sail. (the start line was a mile wide) to top it all the wind freshened from the S.W. which meant a bumpy ride home as well. Oh, the joys of charter boating. 14th.-21st. Strong winds again, curtailed our trips. 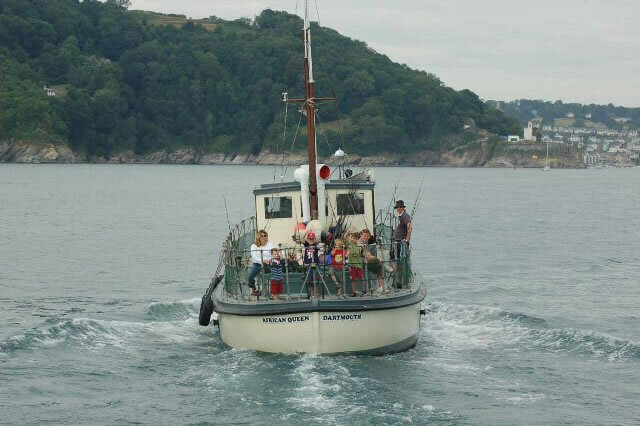 Lots of visitors to Dartmouth who want to fish with us. Oh for some sheltered water close to home. Saturday 22nd. 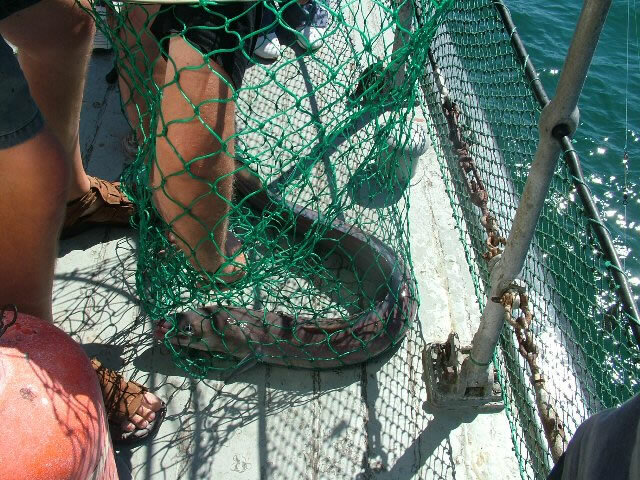 Took out a regular crew and anchored a small local wreck to try for a Conger, result 13 Conger to 57lb with 4 big Eels lost. Our anglers returned all their fish, 23rd.-28th. Busy all week, lots of Mackerel trips, we always go to areas where our customers are likely to pick up a Bass or something other than just Mackerel on the feathers. 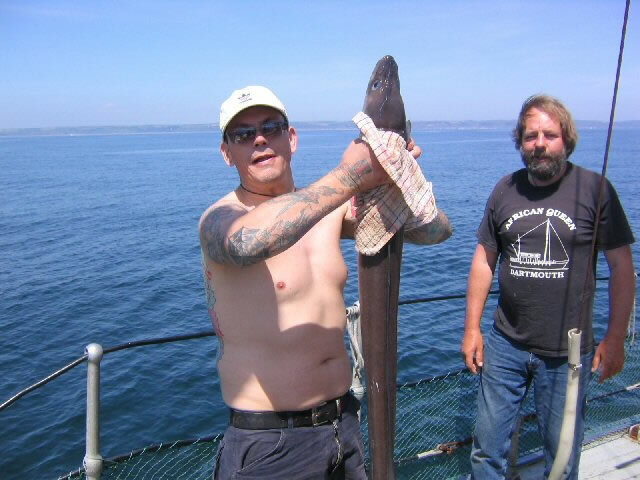 Some will choose to fish a bait on the bottom instead and are generally not disappointed. Saturday 29th. July, The African Queens 60th. 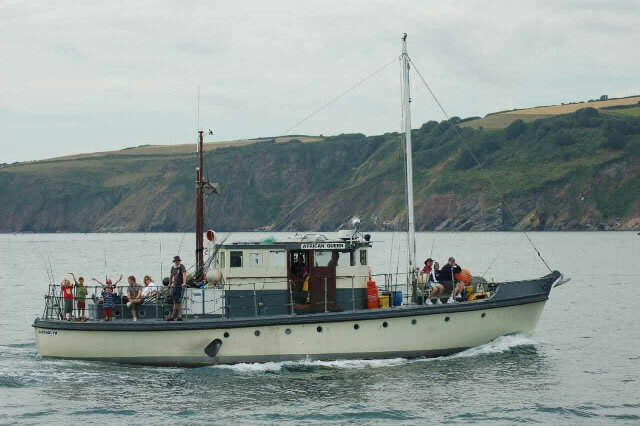 Birthday, She was launched by the British Powerboat Co. on this day July 1946. We had arranged a waterborne picnic with friends and colleagues for this evening but the weather Gods conspired again to stop us. Wet and windy weather means we will have to re- schedule this outing. August. Into our busy time, 7 days a week, often 2 trips a day. This is when we can pay some bills, as always, weather permitting. Day after day of holiday makers and very demanding kids. 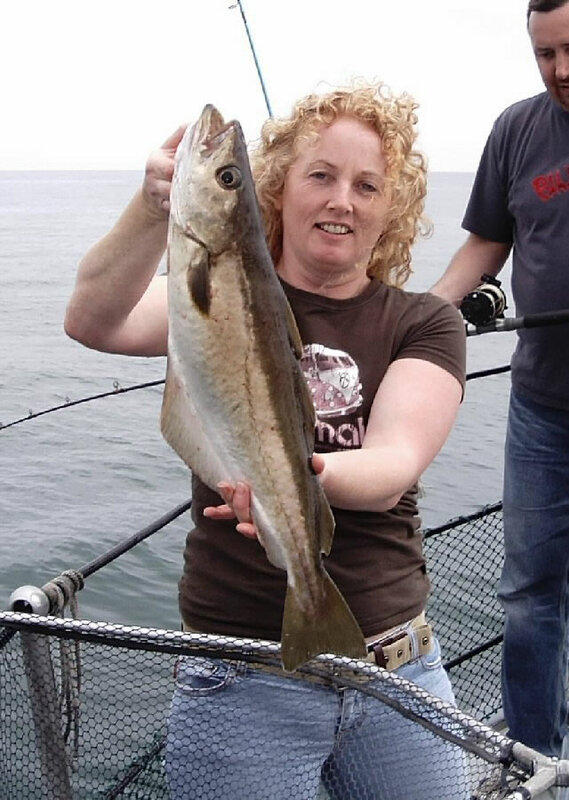 We get sick of the sight of Mackerel, and look forward to the odd weekend when we can get some respite from some more serious fishing with our more experienced anglers. Some good wrecking trips with some quality Ling and Conger. Lots of Bass around but with the average size of the fish small. We had 25 Bass one day with only 4 over the 36cm limit. Next year this will be 41cm. 24th.-27th. Dartmouth Regatta, Committee Boat again, 4 days of offshore racing. Fantastic racing, good wind, the only time that we don't mind if the wind blows a bit, is over these 4 days. The stronger the wind, the better the racing. October. Best bookings we have ever had for this month, all the weekends have been booked for ages. We managed to get out for a day on the 3rd, caught a few late Plaice, plenty of Mackerel and some bits and pieces, an enjoyable day with nothing much to note. All the other trips were cancelled because of the winds. Very frustrating as this is when we should be earning our Winter money. 29th. Managed to get out at last, this is a day we give to The Devon Air Ambulance auction. It is normally purchased by a generous North Devon farmer who comes along with a group of his friends, a good day was had by all, with a lot of South Devon fish going back over Dartmoor to North Devon. November 12th. Brisk Westerly winds didn't stop our group from enjoying a fantastic day on the Skerries. Our first plan to go wrecking was changed because of the weather, so we decided to spend the day drifting the Banks instead. 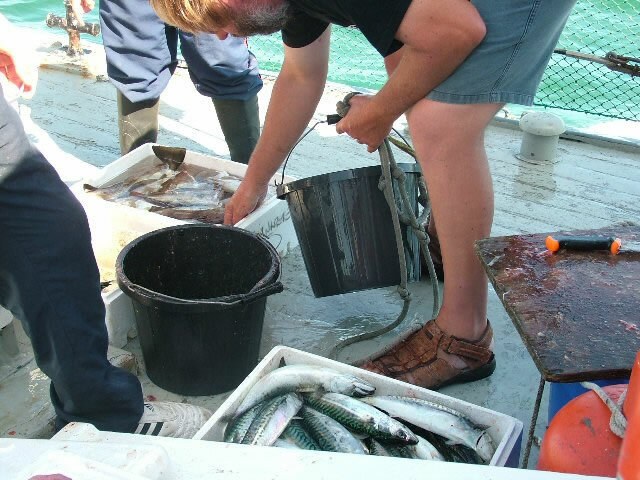 We were straight into loads of large Channel whiting to 3 1/2 lbs, which we continued to catch throughout the day. 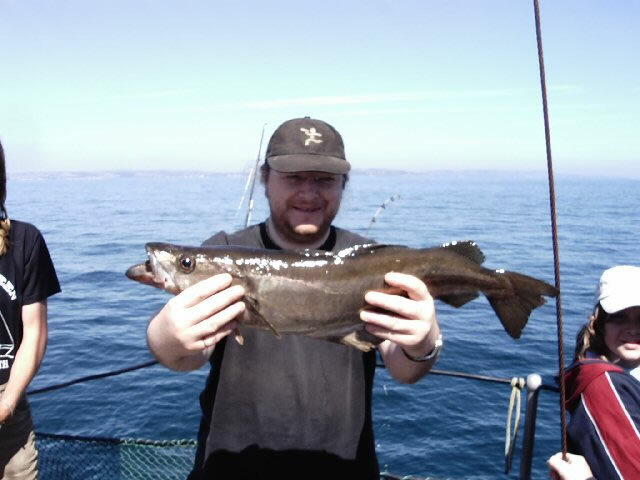 Our first of this Autumns Codling to about 5lbs was very pleasing, as the water temperature is still about 15deg C. Lots of large Mackerel still about and a steady run of bits and bobs along with the Whiting to keep things interesting, including a nice bonus Bass at 5lbs to keep everyone busy on a cold day. 11 tired but happy anglers went back to Bristol at the end of the day. 19th. Fished with a regular group, the weather forecast was half reasonable, but the strong Westerly's came in earlier than predicted and ended with us having an early return to Port. 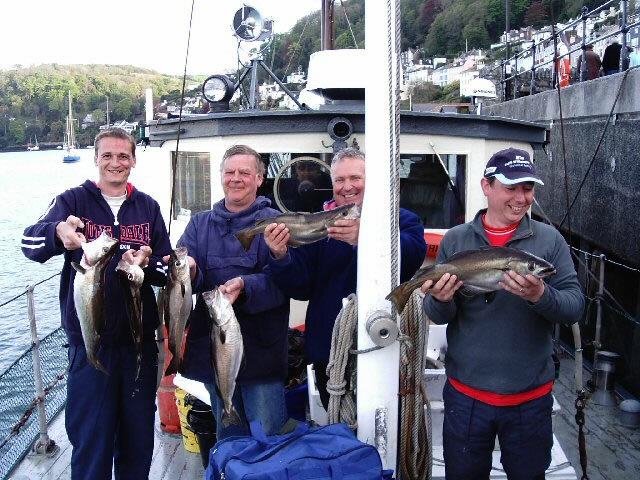 A fair few smallish Whiting, Mackerel and the normal bits and bobs meant the day was not entirely wasted. December 2/3rd Hurricane force winds in Dartmouth, overnight on Saturday/Sunday the winds in the River reached 74 knots (82mph) countless Dinghies were sunk and a 30 foot fishing boat. The winds have been strong all the week and are forecast to reach storm force 10 again tonight Wednesday 6th. Global warming or just an unlucky weather pattern? We are booked on Saturday and next Monday, we won't be out on either of them. Sat/Sun 6/7th. The best weather of the Winter so far, flat calm and sunny. Where are our anglers who have been desperate to get out these last couple of months? Christmas bloody shopping. You couldn't make it up. Anyway, Happy Christmas to anyone who is reading this, and we look forward to seeing you in the new year. Unfortunately I will have to end this year's diary with another bit of bad news just in, it looks like a hammer blow is about to fall on our already over regulated and struggling industry. Read about the Governments proposal to take away from us our use of Red Diesel.